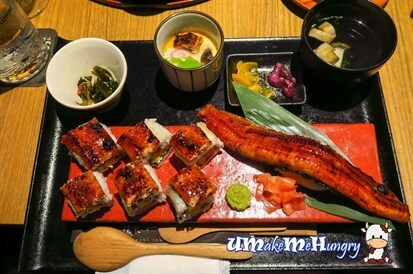 With the parent name as Miyagawa Honten that has a history spans of 125 years is now one of Tokyo's famous Unagi restaurants, operating about 20 outlets just alone in Japan. 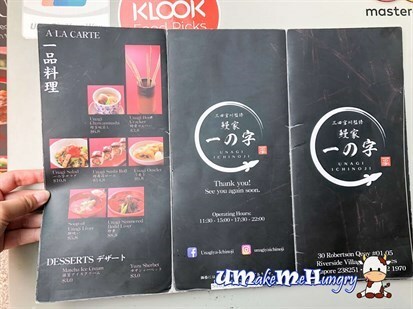 Not only that, recently they have clinched the Bib Gourmand by the Michelin Guide in 2018. Finding the location of this Japanese Restaurants maybe a little tricky as it is located behind some Japanese restaurants or some back passage. 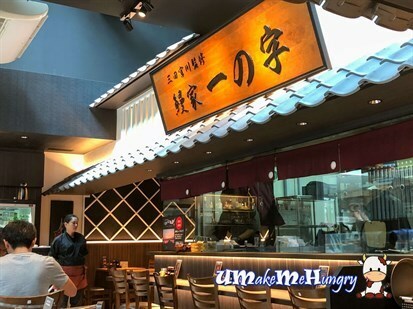 The concept is kind of similar to Man Man Japanese Unagi Restaurant where you get to see freshwater live eels in the tank and chef preparing the eels in an open concept kitchen separating the restaurant and kitchen with glass panels. To achieve the smoky taste with crispy texture, these eels were grilled over hot charcoal. The restaurant has limited seating, about 30 plus seat as the restaurant is not big. If you want to have a greater view of how Unagi is prepared, you can sit by the kitchen counter and watch the process of grilling unagi. 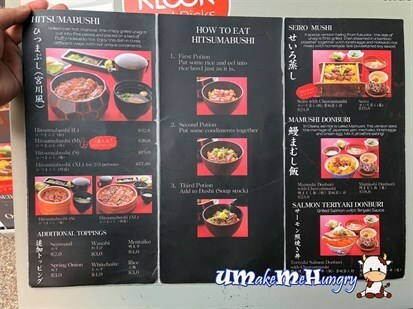 One of the recommended dishes will be the Hitsumabushi. It comes with different sizes from Small to extra large, suitable for sharing. 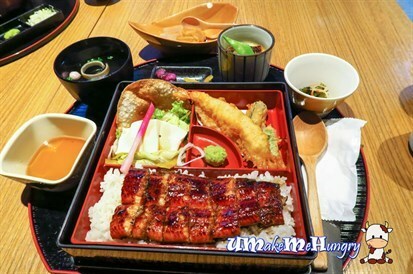 What you get in Hitsumabushi will be pieces of cut eel placed on a bed of Hokkaido Rice and served with 3 condiments. Sometimes by looking at the delicious smoky grilled eels, I felt like ditching the carbohydrates (rice) away but these are not the usual Japanese rice, they are Hokkaido Rice. How to eat it? Dont worry, there are instructions you can follow on the table in 3 simple steps. If you want a more powerful taste, these sauces are yours to add. If you want to add a little more spice, you can topped your food with some spicy sauce as well as pepper. 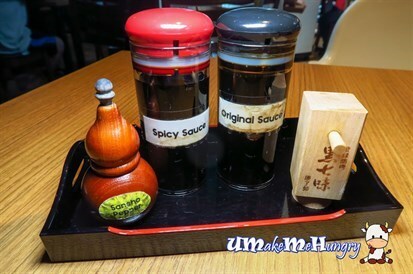 However when I compared the spicy and the original sauce, it was little or no difference to me. 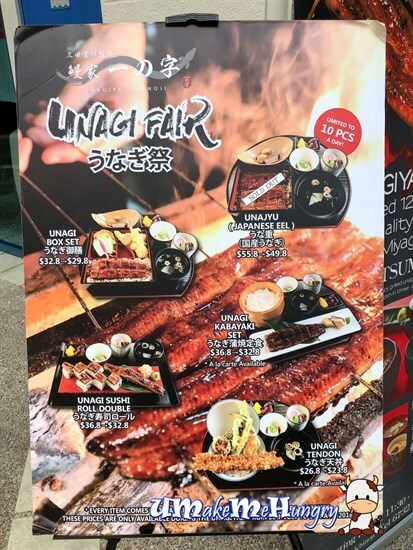 Adding on to their main menu, they have this seasonal Unagi Fair menu at discounted price. 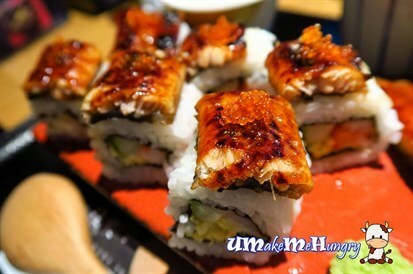 With the special menu from the Unagi fair, I had order their Unagi Sushi double roll. It might not look filling to the stomach but this set itself can be as filling as those who is ordering the Hitsumabashi set. One of the sushi roll in the set was cut into 6 pieces and topped with Tobiko. I would say it was quite flavourful. Besides the alluring flavours from the crispy eel coated in the sweet sauce, the marriage with sushi roll wrapped with cucumber, egg and crab stick elevated the dining experience. Definitely no regrets in ordering this set. Unagi Box Set looked complete with sides and desserts. There are tempura, Gyoza in the Bento Box. Dessert are basically some konyaku stuff with half of it topped with peanut powder. Not too bad though. 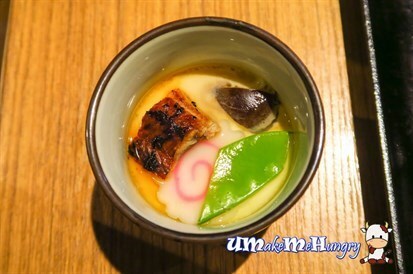 Chawanmushi was included in both Unagi Fair set that we had ordered. It looked a little different here with ingredients like snow pea and unagi, apart from the usual mushroom and Japanese fish cake. 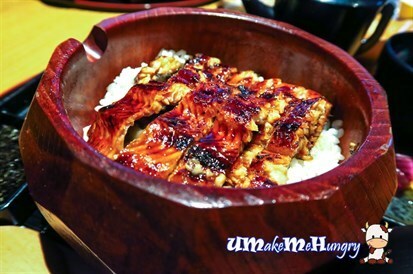 Comparing Unagiya Ichinoji to Man Man Japanese Unagi Restaurant, I would say that no queue is required here. However, I still prefer the latter as the taste was pretty stronger than Unagiya. Taste is rather subjective and if you prefer a lighter taste, you may like what they are serving here. Calling all vegetarians! Here's another Korean option for you. If you heard of The Boneless Kitchen and love what they are serving, you will be glad that the people behind Daehwa are the same. Daehwa is strategically and conveniently located next to the One-North MRT station. Interior is modernly furnished with wooden tables and chairs. Design of restaurant is simple with cement flooring and bright lighting. Before we begin our gastronomic korean vegetarian dinner, we learnt that their food is free of MSG and free of five alliums. As a non vegetarian, I'm quite concern being real thirsty after some vegetarian meals and I'm glad that they are taking care of it. Just like any other Korean Restaurant, these side dishes given are refillable. For those who love Korean Cuisine will be familiar with the Army Stew or Budae Jjigae. This comforting stew is definitely one of the popular hot pot dishes in Korea. Suitable for 2 to 4 pax and comes with 2 bowls of rice. With a balance of spiciness, saltiness and slight sweetness. Being a vegetarian dish, you still get to see luncheon meat and hotdog in the stew but its mocked meat. Other ingredients include cucumber, tofu, noodles, mushrooms, rice cake etc. The initial spicy taste was not very distinct till the broth was refilled at a later stage. Woot! I love this classic savory dish. The sweet potato noodles is paired with mushrooms and asparagus topped with coriander and sesame seeds. It was flavorful and texture was chewy and springy. Recommended! It's not the typical starchy kind of Kimchi Pancake. Tasty when paired with the sauce. However,the circumference of the pancake was charred and hardened, not to my liking, otherwise overall is good. Also known as the squid rings. Wow! This dish swept my feet off. It's meatless yet taste like one. Don't do without the bean paste that comes along with it. The sinful cheesy bowl of French Fries with Truffle. Definitely worth the sharing the calories as the portion is big. Needless to say, they are generously tossed with grated cheese, mayonnaise and fragrantly served. Bet you cannot stop at just one mouthful. 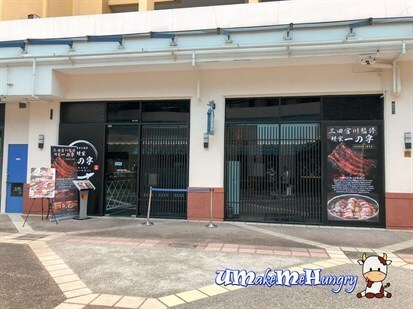 For those who love Boneless Kitchen and do not want to travel into the Eastern part of Singapore, Daehwa will be a very good Korean vegetarian alternative for those who reside in the West.